Richmond Primary School (RPS) is an inner-city school that experiences high demand for student places. In 2010 approval was granted by the North Western Victoria Regional Office of the Department of Education and Childhood Development for Richmond Primary School to set an enrolment ceiling of 350 students. This is based on the number of classrooms available, the schedule of room entitlements, and the limitations of the site. Implementation of this ceiling must be in accordance with the guidelines set out in the Victorian Government Schools Reference Guide. Our current school population is at 366 students which means the 2018 school enrolment is over our enrolment ceiling. This means the school is currently applying the Implementation Protocols detailed below. Clear guidelines on the basis for enrolling students at RPS ensure the process is fair and equitable. The application of this protocol sees us maintaining a waiting list for families who do not have RPS as their closet school and who wish to enrol with us. Please contact us if you wish clarification on this protocol or to apply for a place. Please note: Prep Enrolment Applications for the 2019 intake are due by June 29. Those families that are placed on the Waiting List will be informed about their application status by July 27. To provide clear guidelines and protocols for enrolment at RPS. The following is based on information available from the Department of Education and Training (DET). All students for whom RPS is the closest primary school to their permanent residential address (defined as straight line distance) will be accepted. Priority will then be given to siblings of children who will be concurrently enrolled. After satisfying closest school and sibling requirements, out-of-area enrolments will only be accepted if spaces are available. Students will generally be accepted in order of closest permanent residential address. The Principal has the right, with the support of the Regional Office, to exercise their discretion when deciding out of area enrolments. 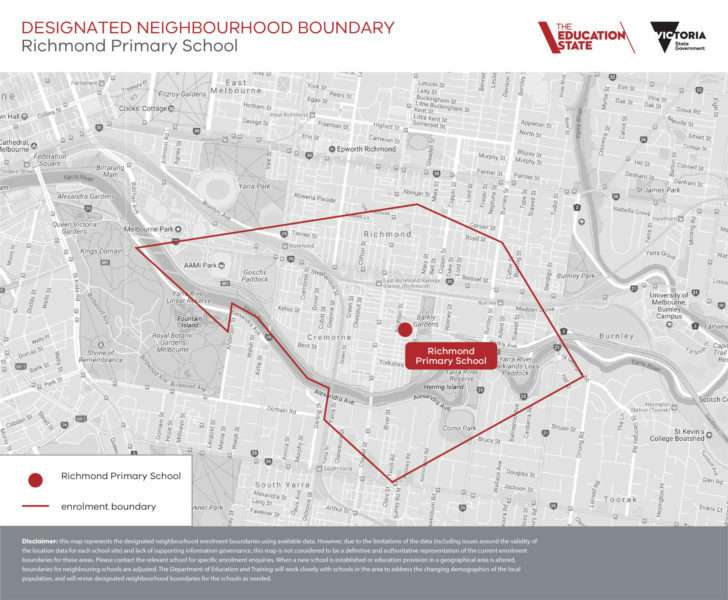 The map at this link Richmond Primary Enrolment Boundary gives a general indication of the boundaries of our designated area. Please confirm with our office if you have any queries as to the specific streets and house numbers that apply.